Over New Years we had dinner at one of our favorite sushi places in Tahoe called Mamasake. 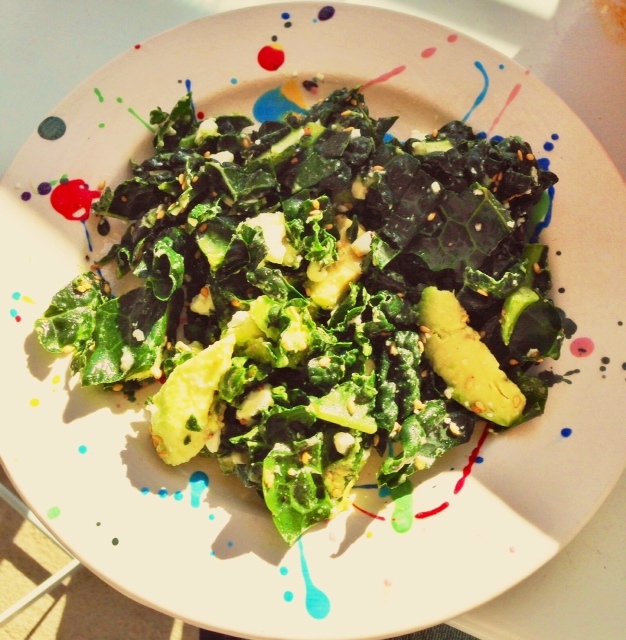 They had this yummy kale salad that I just had to re-create. My friend Marguerite came over for lunch yesterday so we added a few things to it. Below is the recipe. Really easy and yummy. Even my husband who I push kale on too much liked it! Or maybe he was just hungry 🙂 Let me know if you make it. Oh yeah I also put the amazon links for the toasted sesames and organic sesame oil in case you don’t have time to go to the store. Start by pouring half of the kale bag into your salad bowl. Then I use my kitchen scissors to cut into smaller bite size pieces. This is something I am crazy about I like bite size pieces. Next put in the avocado and cheese if you are using. Then you need a small mixing bowl to make dressing. Place all the oil, seeds, rice vinegar and lemon juice into a bowl and whisk together. Add to kale, toss and season with sea salt and pepper to taste. That is it you are done 🙂 Enjoy!